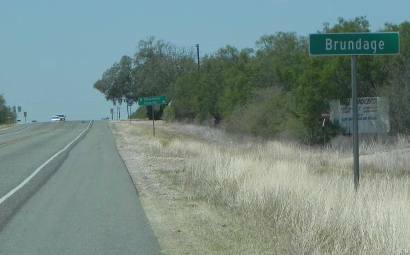 S. P. Brundage platted the town in 1909, and the community grew quickly after it became a stop on the San Antonio, Uvalde and Gulf Railroad around 1910, the year it was granted a post office. The settlement shipped onions, strawberries, and other crops. By 1915 Brundage had over 100 residents, two stores and a telephone connection. An extended drought drove many Dimmit and La Salle County farmers off their land by the late teens. By 1925 the population was down to fifty. In 1936 the community still had a depot and a post office, one business, and a cluster of houses. In 1944 the post office closed, and by 1953 the school had been consolidated with Big Wells. By the mid-1980s the old school building (c. 1918) had been converted into a restaurant but nothing else remained except a cemetery and a few dwellings.